KnottyAlderCabinets.com delivers high-quality ready to assemble cabinets at deeply discounted prices. Take advantage of wholesale cabinet prices and save 50% or more on your project. Request your Free Color Sample today! Our staff will work with you to ensure that your new cabinets fit your home and your style. We offer square raised panel doors in two colors: Natural and Glazed. Also a shaker style in two colors: Mocha and White. Our experienced staff is waiting and ready to assist you. If you need tips on measuring, design, installation, maintenance, or questions about RTA cabinets in general, contact us today! The best part of our job is helping customers get their dream kitchens. Knotty Alder Cabinets has the best deals out there on both beautiful new RTA bathroom and kitchen cabinets. 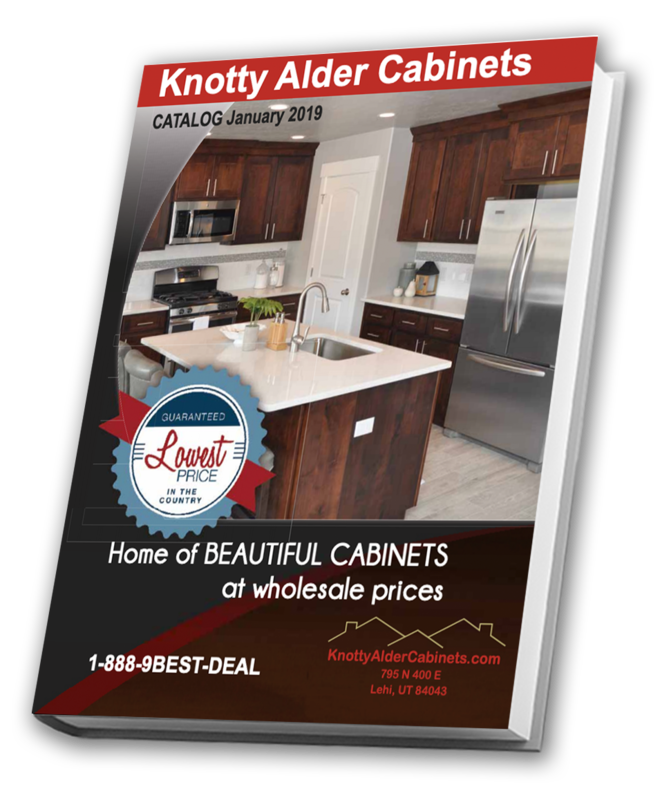 Because of their character, versatility and our industry-leading low prices, designers around the country are choosing Knotty Alder Cabinets for new construction projects as well as kitchen and bathroom remodels. Our innovative process and efficient sourcing allow us to provide the highest quality RTA cabinets at the lowest prices available. We are a wholesale company based out of Utah, and we ship quality Ready to Assemble (RTA) cabinets anywhere in the United States. Even with the price of shipping added to our price for cabinets, we're still by far the lowest priced RTA cabinets in the U.S. And that's a guarantee! Many people sacrifice quality for a low price and are unhappy with their decision later. At KnottyAlderCabinets.com, we sell only the best kitchen and bath cabinets so you don't have to worry about the quality of product you're getting. We save you money by putting our emphasis on creating quality cabinets and avoiding overpriced installation fees. Give us the opportunity to prove that we offer the best RTA cabinet products at the best price in the industry. We guarantee it! Service is always our #1 priority. We've been in business since 1993 and have delivered and installed our wholesale RTA cabinets in thousands of homes and rental units. We've worked with both contractors and individual property owners so you can trust us when we say we'll know the answers to all of your questions. We'll do everything possible to make sure you're happy with the finished product. If you're not sure what color of cabinets you want, we'll send you a Free Color Sample so you can match our RTA cabinet colors to your decor. We're happy to answer any questions you have along the way. Request your Free Color Sample today from the leader in Ready to Assemble Knotty Alder Cabinets and get started on your journey to your dream kitchen or bathroom! Ready to Assemble cabinets are quality cabinets that include everything you need to put your cabinets together. You save up to 50% off of retail by purchasing your RTA kitchen and bath cabinets online through Knotty Alder Cabinets. You can expect a huge price difference between RTA cabinets and other cabinets if you are building a home or remodeling your kitchen or bathroom. Since you aren't paying for installation or assembly, you get a quality product at a huge savings. You don't have to be a life longhandy man to assemble your RTA cabinets; anyone can install their own RTA cabinets. In fact, if any problems do arise, feel free to check out our DIY cabinet installation help guide or reach out to us and we'll walk you through some common questions. You can also contact our team and we'll gladly answer any of your questions! Knotty Alder Cabinets is the home of beautiful and well-made ready-to-assemble cabinets (RTA) sold at the lowest price guaranteed. Through the years, we have garnered a reputation as the best place to find RTA cabinets online. We are known not just for the quality of our products and the low prices we offer, but for our unsurpassed customer service as well. We provide easy-to-assemble RTA cabinets that look great anywhere, from bathrooms and kitchens to laundry rooms and offices. Our products are ideal for DIY homeowners and businesses taking on large construction projects. We offer our products at the lowest prices in the industry – that is our guarantee. As affordable as our products may be, we never skimp on their quality. You will feel it in the smooth, high-quality texture of the knotty alder wood we use. Knotty Alder Cabinets offers a low-price guarantee. We offer the lowest priced RTA cabinets in the country without sacrificing quality. With our broad inventory, sourcing the products you want will not be a problem; expect quick delivery of your items. We follow a proven shipping process which helps prevent any damage during shipping. Request a free sample to experience the Knotty Alder Cabinets difference. Unlike traditional cabinetry that requires the assistance of contractors and builders to install, you can assemble RTA cabinets yourself. This takes away the need to pay for outside labor, making the cabinets more affordable. The assembly process is pretty straightforward. It only takes a few simple tools and basic skills; one can finish the installation in 30 minutes to an hour. Let us help you choose the cabinet that works best with your existing design. Call us toll-free at 1-888-743-0982 or fill out our form to receive a free sample, a catalog, or a quote.